Choose a freshwater fish. Though ocean dwellers tend to be more colorful, their saltwater tanks require much more maintenance. Want more than one? Guppies are great; they are small, beautiful, inexpensive and friendly. 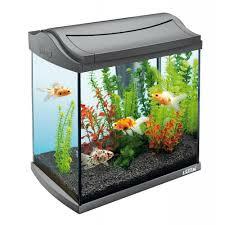 Goldfish are also a popular choice, but they are a bit messier and can grow too big for a starter tank. Buy a 10-gallon plastic starter tank with a filter. It will hold a few fish and the filter processes waste; clean water is essential for proper breathing. Consider a Betta. Also known as Siamese fighting fish, they are stunning and do not need much care. You don’t even need a tank with a filter. But Bettas will fight, so only one per bowl! Don’t overfeed your fish. It is very important to know exactly how much and how often your fish should be eating. Improper feeding can cause serious health problems. Talk to an aquarium store employee if you have any questions. They tend to be more knowledgeable about fish than the average person working at a regular pet store.